Now doesn’t that just cheer you up? I know! Me too! This used to be a fitted queen sheet which I shredded and wound into a ball a long time ago. Then, I happened across this pattern and thought red would be nice. And it was! This is a super quick project – knit on enormous needles, and very satisfying! Considering that I ought to be in a screaming panic trying to get us ready to head off to Seattle super early Thursday morning (which I was somehow thinking was a long way off…), and that I am way behind on the laundry ( a baby accident took out all of our bedding this morning), taking some pictures of last weekend’s project was just what I needed…. very therapeutic! Very jolly indeed! Hope you have a lovely journey! We’re off Thursday (very early as well) to the OR coast to meet up with Gregory and Cynthia for a week on the coast! I so love your colors. I think it would be brilliant of you to give us a virtual tour of some of the rooms of your home. I would love to peer into your living , dining and kitchen rooms to see your designer sense at work. Perty puhleasssseee. 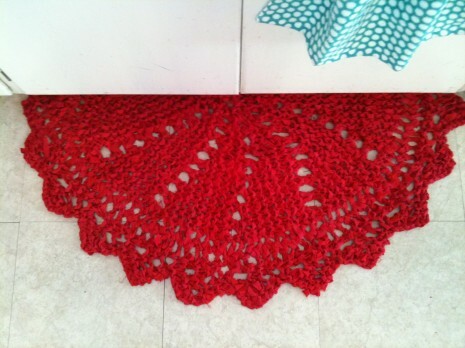 I had never heard of rag knitting before, so I think this is pretty amazing. Beautiful and inspiring. Is the blue spotty a curtain? Love the cheery red! Okay, I confess, I have been looking at this picture trying to figure out what I was looking at. I first thought it was a doily of sorts until I read that you made if from a sheet. But I finally see that it is a rug next to a counter. Cute! How on earth do you do that?? Oooh! Rag knitting is new to me. How neat! Knitting on super large needles *does* sound like fun. Do you use circular needles for large projects like blankets and rugs, so that the project has room on the needles for all the stitches? Isn’t it great to post pictures of completed projects? In the midst of the chaos it is something you can point to (or look at in the kitchen or wherever with a sense of satisfaction) and say “there! that is in order!”! Somewhere around four or five kids, I found I was suddenly highly distractible. Like I would start art projects or decide to clean out a closet just when I should be packing the car for a trip. Wonder what that’s all about. It’s still hanging around ten years later. But it is cheery, whatever it is!! Hi Rachel, I had to tell ya – I had an old red sheet I kept so when I saw this pattern I shredded that sheet up so fast and have been workin on it ever since! 🙂 Love it!!! Just the thought of doing something like that, although it is beautiful, is overwhelming to me. Congrats on a job well done. Have you seen the new post on http://www.purlbee.com? Bright cheery potholders. I thought of you. I’ve got the knitting thing down, now if I only knew how to crochet.